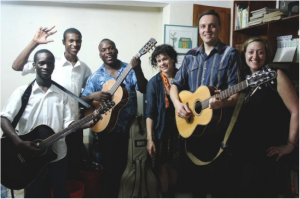 Arcade Fire recently teamed up with Montreal-based guitar manufacturer Godin Guitars to donate several guitars to the musicians and young people of Haiti. The instruments are meant to give hope and entertainment to the Caribbean country following the devastating earthquake of 2010. Win Butler, Régine Chassagne, Will Butler, and Marika Anthony-Shaw of the Montreal-based, Grammy Award-winning band have long supported efforts to rebuild Haiti. The troubled country is very close to Arcade Fire’s hearts, especially that of singer/multi-instrumentalist Régine Chassagne, whose family emigrated from Haiti to Canada before she was born. The band has traveled to Haiti numerous times to perform and offer support. During a visit in March 2011, Arcade Fire performed a show at the Hotel Oloffson in Port-Au-Prince and a concert for several thousand Haitians at the Partners in Health hospital in Cange. They have been avid supporters of the non-profit relief organization for several years.